Tony and Suzanne Marriott's Phoenix Arizona Real Estate Blog: Think You Can't? Think Again! 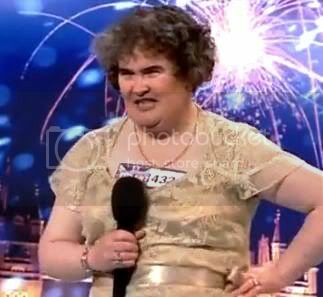 I'm sure most, if not all of you, have heard of Susan Boyle and her amazing debut on Britain's Got Talent. It proved to be the biggest opportunity of her life! If by chance you missed it - here is a link to the video of Susan Boyle singing "I Dreamed a Dream". It's a stunning example of how it's never too late to achieve one's dream - whether it's to be a singer, or a success in any other endeavor. When you need some inspiration - go watch this - truly amazing! I watch this at least once a month! Good morning Tony and Suzanne. Your point is well made. Sadly Susan has had problems since but does have a gloeious voice. Good to have an "inspriration place" and she certainly provides that ! She is an inspiration to all of us. Proves just follow your dream and do it. Hi Tony Tony and Suzanne Marriott, Associate Brokers Are you working today? She does have a very lovely voice. I'm not sure she knew quite how to handle the fame it brought to her though. Hi Tony and Suzanne Marriott, Associate Brokers , I remember when that happened. It was an awsome momemt. Especially for Simon Cowell. I just relistened to it and it gave me goose bumps, just as it did so long ago. She has got it! Everyone there was astonished Sheila Anderson - thanks for stopping by with a comment! She does indeed Sally K. & David L. Hanson - thanks for stopping by with a comment! That's what I'm saying Harry F. D'Elia - thanks for stopping by with a comment! I am today Bill Roberts ! The price of success Tammy Lankford, ? - thanks for stopping by with a comment! It was a real wakeup call for Simon, wasn't it Larry Johnston ?! - thanks for stopping by with a comment! She has indeed Evelyn Johnston - thanks for stopping by with a comment!